The veterinary drug company, Zoetis, just released a new treatment option for dogs with atopy (e.g., canine hay fever – instead of sneezing and sniffling, dogs itch instead from allergies!). 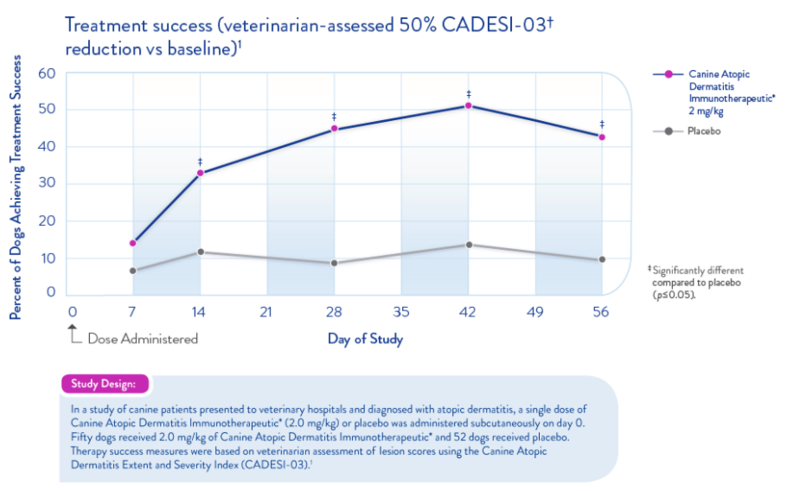 This new drug called Canine Atopic Dermatitis Immunotherapeutic (CADI, for short), is now available for both general veterinarians and board-certified veterinary dermatologists to use. 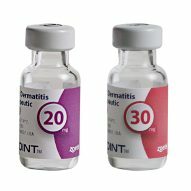 This is an injection of the molecule IL-31, and is an antibody injection to help manage and treat dogs with allergic skin disease. IL-31 is one of the substances that causes itchiness, so when you use CADI, it acts as an antibody for IL-31. This binds to the IL-31 and deactivates it, making the dog less itchy (e.g., pruritic). In other words, there’s a protein in dogs with atopic dermatitis that is important in making them itch – and CADI helps bind to and neutralize that protein. 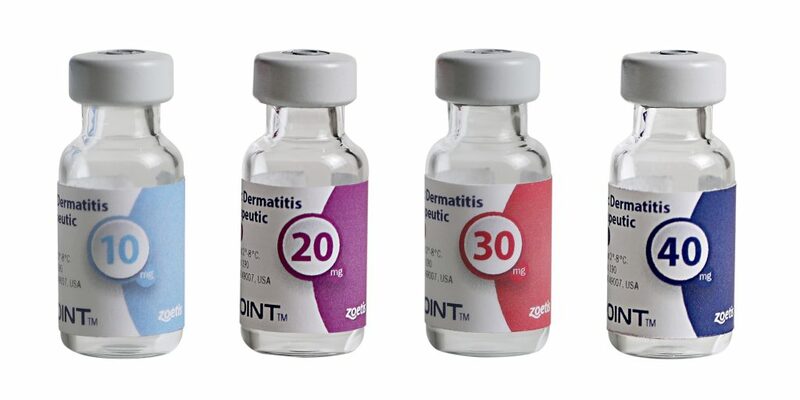 This new treatment is given as an injection to dogs – your veterinarian or veterinary dermatologist will give it under the skin (e.g., subcutaneously) as needed, up to once monthly. (Most dogs get release for 1-2 months). It can still be used with other medications (e.g., anti-histamines, steroids, etc.) while your dog is being treated for his or he atopy. However, it cannot be used in cats, as it’s a dog antibody! In the veterinary studies that have been done, 80% of dogs did achieve a significant, measurable improvement in their severity of itchiness (per the pet owners). In approximately 50% of the cases, skin redness improved (according to veterinarians). Keep in mind that this new treatment drug is not an anti-inflammatory – it only takes away the signs of itchiness, so your dog will still need to be appropriately treatment with medications as needed to control the atopy (which may including topical treatment, prescription weekly shampoos/mooses/creams, etc.). Are there are any signs effects? You can see the adverse effects below, but so far, most of the effects are gastrointestinal related (e.g., vomiting, diarrhea) and lethargy in a small percentage of dogs. 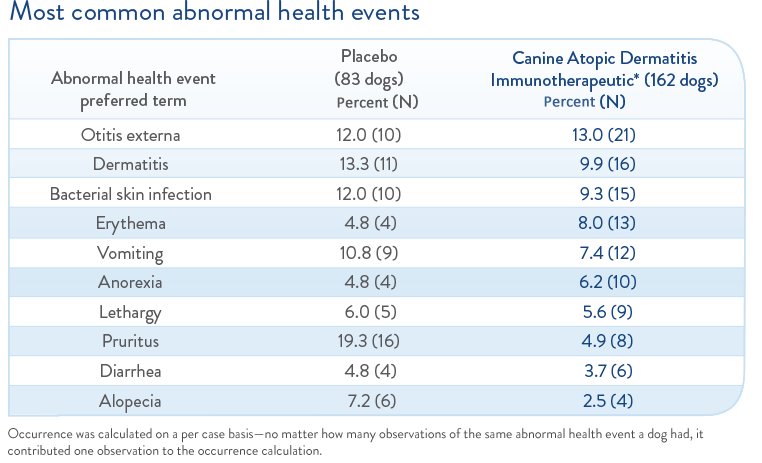 IL-31 antibody CADI varies in price based on the size of your dog, but when in doubt, talk to your veterinary dermatologist about it. On average for a 10 pound dog, it is approximately $50-60/injection, while for an 80 pound dog, it would be closer to $100-150/injection. If you or your veterinarian have any questions about the drug, or think your dog may have had a possible adverse effect, please make sure to always call the drug company directly to report this. While side effects are rare, they should always be reported. YOu can call Zoetis’ Veterinary Medical Information and Product Support (VMIPS) at 1-888-ZOETIS-1. For more information, go to Zoetis or talk to your veterinarian or veterinary dermatologist. How many consecutive months can they get the shot or is it lifelong? It’s actually only available to veterinary specialist dermatologists at this point, and so it would be at their discretion based on how they respond to treatment. It’s likely lifelong and they will need the injection every 6-8 weeks. My 120 lb GSD is on this. It lasted almost 4 months but we use it with redonyl which seems to have extended the time of relief. We were told he might need it monthly but we had to see how he reacted to it. He needs 3 vials for his weight and the cost was $165. Very happy with the results. He’ll be getting his next shot this week. So happy to hear he is doing well! Is it safe for a 4 1/2 month old puppy? HOWEVER, as it’s conditionally released, I would definitely consult with a veterinary dermatologist before starting it in a puppy, as there are a lot of other more common causes for itch in puppies (e.g., demodex, etc.). While I mourn the loss of your dog, developing a hemangiosarcoma heart mass that causes internal bleeding and secondary pericardial effusion has nothing at all to do with ANY medication. It’s an inherited type of cancer commonly seen in Golden retrievers, Labrador retrievers, German shepherds, and mixed breed dogs. So there is no correlation with the allergy drug. Excuse me. If you don’t see the connection between giving long-term immunosupprissive drugs and cancer you need to take off your blinders. I have been a vet for 36 years and I want to throw up when I see responses like this. This reply is for Dr. Thomas, the supposed vet who replied to Justine. First off, Cytopoint injectable is NOT an immunosuppressive medication at all, so responses like yours are not only irresponsible, but show exactly how uninformed a supposed vet can be, (if indeed you even are a veterinarian???). The irresponsibility of your reply, (not to mention your inability to spell – ‘immunosupprissive’ – really??? ), are what makes me want to vomit as you are spreading lies onto the internet that are potentially read and believed by others who lack, and are seeking knowledge. Furthermore, as a veterinarian myself who has been in the profession for 53 years, I would have this to say to you – take your ‘misinformation’ and mistruths and go spread them elsewhere because I’m pretty sure the kind readers of this blog and I don’t really need to hear them! This reply is to Dr. Grant. If you read the post closely, you will notice that Dr. Thomas was replying to Carvalho- who was specifically addressing APOQUEL. You were critical and condescending to Dr. Thomas, simply because YOU misread what he was discussing. You REALLY should apologize for that and read more carefully next time before you post that someone is irresponsible, liar and one who lacks knowledge. It is you, in this instance, who was irresponsible and swift in making an opinion about someone. By the way, it is VERY easy to mistype something; that is called a simple mis-stroke of the finger. Your mistake was HARSH and unnecessary. Careful before you “eat your own type” the next time. And, I made very certain that I checked my grammar and punctuation to prevent a grammar lesson here. My 4lb Yorkie has been getting the CADI injection for over a year. The only side effect is, no itching. I’m not a fan of giving unnecessary drugs to my dog. I tried everything homeopathic including acupuncture and Dynovite. CADI is the only thing that has relieved her distress. Oh my gosh I tried the Dynovite as well! I thought I was the only one who knew about that stuff! I am so sorry for your loss! My girl Sophie got a cancerous mass from Apoquel. It was a very aggressive cancer that took her from us in a very short period of time. There was nothing they could do about it. It even shows on the commercials now that one of the risks of Apoquel is cancer in long term treatments. I’d rather have my itchy little dog back than to have put her through that. Aspirin can kill you, also. It would not be approved by the FDA today; it is “grandfathered-in. Ir is an absurd, dangerous and irresponsible asssertion to imply this medicine is poison, as with any substance, the dosage is the poison (water cal kill you if you drink too much, and cyanide –that is off-gassed fro your car’s dashboard-is harmless inflow doses). It also demonstrates felonious ignorance that you call the vet unethical, and employ ridiculously foolish hyperbole the vet “assassinated” your dog. Further, you do not even know that the Apoquel was connected in any way with your dog’s unfortunate disease. Lack of knowledge is a sad circumstance. I am incredibly sorry for your loss. I am definitely not a fan of any meds that are not needed, and your vet should have informed you with more information about the drug he prescribed. I will have to say though, the website for Apoquel does actually state it is intended for short term use only. My vet gave it to me for my pet, and I was desperate at the moment–so, when I got home and read the info on the website, I decided not to give it to my dog. I am not trying to be un-compassionate,–believe me, I know the pain of the loss of a pet. But the manufacturer provided the warning. If you haven’t changed vets (if you have gotten a new fur kid) – – you might want to consider doing so. –My deepest sympathies for your loss. Your dogs skin disorder may be caused by the hypothyroidism, and not an allergy. It’s one of the symptoms. Hopefully your Vet is treating her with supplements and once the thyroid is in balance her skin issues will be, too. For sure – hypothyroidism, hyperadrenocorticism, diabetes, etc. can cause chronic disease disease and a thorough veterinary exam + blood work is necessary when working up these cases! Glad your dog is better! Hypothyroidism causes symptoms like allergies including itching. You should ask your vet, look it up. My 7 year old Labrador suffers from erythema, crusting, and skin irritations on her elbows and feet. We’ve tried everything from pred to apoquel. Apoquel seemed to work but a 30 day follow up showed blood in urine so apoquel was discontinued. We treat her with weekly medicated baths (Malaket) and a mousse product from Sogeval. I am hesitant to try a new drug that is injectable (as treatment cannot be stopped obviously once injected) because of her prior history of kidney and bladder hematuria (other conditions were ruled out as a cause so we are pretty sure it was Apoquel caused). Are there any other safety studies available at this time specific to side effects like hematuria? Thanks. I’ve never heard of hematuria as a side effect, but I would definitely consider having your veterinarian report it to Zoetis and see if this is a known adverse effect (albeit rare). Have you considered consulting with a veterinary dermatologist? This may be very important to make sure it’s not an underlying pyoderma, food allergy, etc. vs. atopy. Diet is very important with your dog’s symptoms. Grain free is a must. Raw meat is an excellent source of food. Research it online. Actually, there’s very little evidence that it’s the grain that results in issues. With food allergies (not ATOPY), allergies are typically due to beef and chicken. This post is a year old, so hopefully by the time you read this, you will be up to date on your information. Veterinarians now are finding that a grain free diet leads to liver & kidney issues in dogs (eventual liver or kidney failure). I would discuss this with your vet, if you are feeding a grain free diet. I would also check with other vets so you can get a wider knowledgeable perspective. On a side note, we got a new Bassett Hound puppy who was constantly itching! He was miserable when we brought him home at 8 weeks old! The vet gave him a shot of Cadi (this medication) & in 24 hours, he was totally itch free & happy!! They did skin scrapes in two different places, prior to the shot & could not find a reason for the itching. Whatever it was, he’s been fine since! It’s been 5 weeks now. In Golden retrievers, a severe type of Dilated Cardiomyopathy is seen! When in doubt, talk to your vet about this. That’s right Justinelee. Holly Camp hot very wr ok ng info. Grain free doesnt cause kidney or liver failure at all. Why do folks post such crap? Grain free has been seen to cause taurine deficiency, therefore in turn causing heart issues….maybe…..it still needs more research. Bovine Colostrum …..is a great supplament for miserable itchy dogs. Allergies is not a cause of the itch and breakdown of the skin, it’s a symptom. Proteins, transaminoacidtrpho,IgA, other animals proteins……blah, blah that we feed our pets, vaccinate our pets with, etc. etc. are the major causes…… Research the history of Allergies, Serum Sensitivities, etc. You can see what’s either missing from or unnecessary in the food you give your pet. Apoquel was researched in a 7 day study. There weren’t any long term effects study. My suggestion if your looking for quick relief while changing up the food plan is Cytopoint. It is not an immunosuppressant medication like Apoquel! Cytopoint/C.A.D.I. is a whole different ballgame! Hmm, I would contact your veterinarian and have them report this to Zoetis. I’m so glad his blood work is normal, but am concerned that it’s been going on for THREE weeks. The same thing has been happening with my dog for two weeks since the shot. 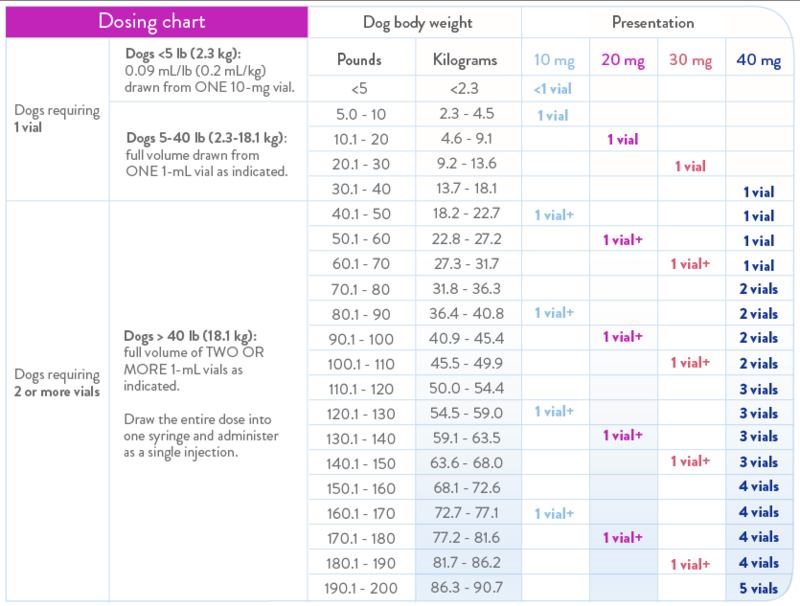 How long was your dog lethargic? Did you do anything to help? Thanks! Correct – that seems much too long for me! How odd. I got my daughter he the shot about 2-3 wk’s ago both small Pom-chi mixes. They both seem Lethargic and “mopey” they’re eye are excessivelyvwatery ( more than usual) and phlegmy The one is still scratching like crazy at night. My lil preset now sleeps by the wall side of the bed rather than with me or the other dogs Will they recover once the shot wears off? I am considering this medication for my 2 year old male pitbull. We triied apoquel and got zero results, Prednisone only worked as long as he was in the medicine, and now we are currently on atopica and an immunotherapy made specifically for his allergens. I’m looking for a second opinion…. Would you recommend keeping him in the atopica while trying the new injection or would you substitute it for the atopica. He just started the immunotherapy a few months ago so he needs to continue for a full 12 months. I would recommend working with a veterinary dermatology specialist to check to be on the safe side. Both drugs work differently, and he may need allergy testing, food trials, etc. to make sure he’s going to respond well to therapy first. I have a male pit that received the shot today after many other attempts! I can let u know how it goes for us! I have a German Shepherd who has had the injection twice. The first shot was in April and the itching stopped within the first 24 hours. The itching started again 4 months later and we did the injection again and the itching stopped again within 24 hours. I tried the Apoquel before the injection and did not have great results. I have seen no side effects with the CADI injection. Thanks so much for your update on your dog. Good to know. My 55lb beagle mix had his shot yesterday for the first time. Since, he has been very groggy, dry warm nose. He’s just not himself. Not playful at all. Could this be caused by the injection and will it go away? I’m really worried about my baby. Oh no – I would call your veterinarian right away to report this and make sure your Beagle is ok! My cairn terrier was tired for 3 days and is now having neurological issues. Very sad and scary. A little too coincidental for me. I will never give her another injection. This isn’t a reported side effect, so I would get to a veterinarian ASAP to make sure it’s not something else going on (e.g., ear infection, vestibular, etc.)! Allowed my vet to give shot and my dog was perfectly healthy prior to the shot with no issues then noticed excessive thirst, bloating and unsteady on feet. Shot works for itching but seems to hurt in other aspects. 2 shots and now she has a neurological issue as well. This was the only change in her caretaking. My dog had the CADI shot in October and again in December. She had relief starting about 48 hours after and it lasted 4 weeks and then wore off over a week. Allergies are bad again now that Spring pollen is out and I’m considering another CADI. The allergy specialist told me it might have less effect with each successive CADI shot when we had the second. Anyone found it less effective over time? Also, by doing this am I suppressing her immune system and making it less likely that she can get cured? I understand steroids make it virtually impossible to strengthen the immune system and condemn the dog to a lifetime of shots, and she had two steroid shots about a year ago before I knew that. She also took Apoquel last year and it was a miracle drug at first but then lost effectiveness and made her crazy manic and I took her off it worried about what I was seeing. Is CADI another Apoquel-like thing only in a shot? I’ve spent the last four months doing everything I can to build her immune system (sublinqual allergy drops, Nutriscan food sensitivity test and feeding her appropriate non-kibble rabbit diet based on results, supplements, coconut oil, Mercola Seasonal Support with Quercetin, etc) and I don’t want to undo progress if CADI is a fad that gives a few weeks of relief but condems a 3 year old dog ot a life time of misery. I would make sure you’re consulting with a dermatologist. CADI is not like Apoquel (works by a different mechanism of action), and you definitely want to discuss multi-modal drug therapy (e.g., using multiple drugs together to minimize the signs in your dog!). Don’t give up – atopy is treatable! Thank you for your response. Much appreciated. Glad to hear CADI and Apoquel are different as that worried me. CADI given by dermatology specialist at large regional animal medical and cancer center. Specialist also did the environmental test and prescribed the sublinqual drops (allergy “shots”). We also have a traditional veterinarian and are seeing a holistic vet for laser treatments and diet related items. I think we are multi-modal. At moment feel like the Mercola “Seasonal Support” supplement and Nutriscan saliva test have been my best investments but hoping all these veterinarian prescribed items work together over time to get atopy treated – that includes CADI. Will get the next CADI this week. Used Apoquel, when dropped down from 2 to 1 it quit working. Just got the cytopoint shot and it worked great but only for 2 weeks. Now for the past 2 weeks until time for another shot, he has been chewing, itching and licking non stop. Any suggestions? Talk to your veterinarian as sometimes the twice a day Apoquel is necessary. Your vet might recommend antihistamines until the next injection. Have any of you tried either Fish oil, or LIQUID FLAXSEED and LOCAL HONEY? My 7 lb Shih Tzu has horrible allergies. She’s allergic to so many things-foods and environmental. I’ve done allergy testing on her so I’m able to eliminate some foods. She’s allergic to so many ingredients. It’s been such a struggle. I have her on Instinct Turkey Meal, so the food is ok. She itches a little in the Winter but when Spring comes-ouch. She used to lick, scratch, chew constantly. She used to get Hotspots and crusty pimples (not sure I’m describing her symptoms correctly). Nonetheless, it’s was a myriad of Allergy symptoms. Finally, I put her on liquid Flaxseed (purchased at Vitamin Shoppe stored in the Fridge) 2x daily into her food and the crusty pimples disappeared. Skin became better, but still other symptoms. Recently I purchased LOCAL HONEY (literally from my state, next town over) at Stew Leanards, and have been giving her a small dose daily. I mix the honey with water and syringe it into her mouth to make sure she drinks it 1x a day. So far, her itchiness seems to be better, Normally, she would have gotten a Steroid shot in early March…..so I’m keeping my fingers crossed…. I use fish oil and vitamin E with the cytopoint shot and redonyl. I just had my Morkie to the vets for routine blood work and urinalysis. My little one has been on the CADI injections since December 2016, once a month. Her urinalysis on 04-28-17 showed low Specific Gravity (1.016) & PH (8.0). My vets concern was with the CADI shot as to whether or not this medication, over a period of time, could have an accumulative effect causing urinary issues such as this. I am presently waiting on my Vet Dermatologist to get back with me which won’t be until 05-02-17 as she was out of town when I sent the urine results to her office on 04-28-17. She has been drinking more than normal but because her blood work showed normal for the most part, her regular vet was just concerned about the long-term use of the CADI injections. Apoquel did not help her at all and right now after treating her skin issues with other medications and then changing her diet she appears to be doing a lot better with her skin. She will start itching more at the end of her 4 weeks after an injection. I just want to make sure that this is definitely a safe drug for pro-longed usage. I don’t want to cause other issues trying to treat one. Diane – my dog has an elevated BUN on her blood test. It went from 22 a week before her first CADI to 33 in ten months after 4 CADI shots. Vet worried about her kidney but has not yet mentioned CADI as a potential culprit (I’m making that potential link since she has not had anything else in this period and she is only four years old). I appreciate the lectures you give. I appreciate this article! My poodle has hayfever and I was having a hard time finding information. Any other resources would be appreciated. Thanks! Keep up the great work! It’s unlikely the shedding is from the CADI, but likely secondary to the season + skin disease. My lab is also shedding excessively after just one injection and no relief at all to his sore paw which he is licking as much as ever. Not impressed so far. How many days ago did he get it? I would contact your veterinarian! My Japanese chin was on apoquel for 2 years and it all of a sudden stopped working he’s had 2 cytopoint injections so far but they only last him about 2 weeks. Does the apoquel work with the cytopoint? Because as of right now he’s only on the injection. I have a question. My Yorkie had her first CADI 4 months ago. The first shot worked like a miracle drug with no itching at all. I was so excited to see her able to rest without biting and clawing herself. But every other one has minimal effects. I don’t understand 🙁 Have you heard of this problem? I haven’t heard of that but would recommend to be checking with your dermatologist as soon as possible. My 9 year german Sheppard got the shot a month ago and it wore off after 3 weeks. I would like other options that are not so costly for his itchiness. He just developed this itchy condition a fee months ago. Any suggestions? Was told he could have benadryl to help, but that makes him tired. Help please. Isn’t it just Masking the Symptoms while the Allergy Fire only Burns Brighter &Hotter ? Why not Extinguish the Allergy Fire to begin with ? I have a dog with lymphoma who is in remission after t-cell infusion immunotherapy. He cannot have any steriods or anything that would decrease immune system function as those can hinder the effectiveness of his expanded and infused T cells. Is this drug something that could effect t-cell effectiveness? I definirely would not use this in an immunosuppressed dog without consultation from a dermatologist or oncologist. That is the problem. The oncologist is not not sure if it would have an effect on his t cell infusion or not. I’m not going to try it. My French bulldog had this medication in March and it seemed to have worked for her allergies. Today she was given this medication and on our way home she went into respiratory distress. I thought I would loose my puppy. Rushed her to veterinarian hospital. She recovered on her own. I will not be allowing this injection ever again! My 12 year old Miniature Pinscher was given this shot last week. He seemed fine for a couple of days and now he is not eating, his eyes are very goopy and swollen looking and he is very lethargic. Then this morning he threw up stomach bile looking stuff so I made him some rice and chicken which he ate partially after much coaxing. Bhebwas on apoquel for a year until it quit working and his liver counts were high, I decided to do the CADI but now I’m worried because he’s not feeling well. He NEVER passes up food and I’ve never had to coax him to eat…ever. I’m worried about my little old man! Our 6-month old Cairn terrier, 15 pounds, got the Cytopoint injection for the first time about 2 weeks ago. He had been scratching his legs and licking his feet so much that he ripped the hair of all 4 of his legs. Within several hours of this shot, he was doing much, much better. Unfortunately, the effects seem to have lasted only about 2.5 weeks. He’s starting to scratch and lick at his paws again. We’re about to take him back in for his second shot. I’ll report back on how it goes. Elizabeth, did you get the second CADI injection right after the first one wore off , or did you wait so that it would be 4 weeks between shots? Thanks! I thought the shot is suppose to work for 3 to 4 weeks! We just took our chihuahua to get this shot today. He has a liver disease and can’t take just anything. Pray this works for him, we have tried several herbal remedies to no avail. Poor baby skins so raw! We are becoming concerned about Cytopoint. The first inject was amazing and out mixed breed went over 8 weeks without itching and hotposts. After the second injection he is showing a great deal of lethargy and then a severed urinary infection. The urine was very cloudy and lab results showed blood also in the urine. He is a different dog. Has not appetite in the morning and just acts ‘drugged.’ We will consider going back to Apoquel, but it was nice not having to give daily pills. Our 3 month old Great Dane pup got the cytopoint shot last Friday and had severe diahrrea for 5 days. Gave her immodium twice Tuesday and have had her on chicken and rice. She’s down to two less than pudding consistency now but how long before the side effect of diahrrea goes away? Oh no! I would check with your veterinarian about starting canned W/D (high fiber food) to help with the diarrhea. It’s weird to have a puppy that young have atopy, so I would make sure your puppy didn’t have another cause for itching (e.g., Demodex, sarcoptes, etc.). This all scares me to death. I just today gave my first shot of this, to a 2-year-old Lab who presented itching badly a few weeks ago. My vet assured me there were no side effects. From ALL of these posts, that seems not to be the case. Has ANYONE used this with success?? My 14 month old boxer had his first shot 2 weeks ago and has been virtually itch free! However, I awoke to find he had wet the bed this morning. He has never had any indoor accidents before and I can’t help but wonder if it may be related to the new drug in his system. Has anyone else had a similar experience? Interesting kbeayon, no, we have had seemingly good results from first Cytpoint shot almost 6wks ago. Keeping fingers crossed won’t have to give another for awhile. Though our normally itchy pup does still lick his paw pads alot. Not sure if that’s anxiety related since he was a rescue and has always done that, or if his licking obession is allergy related. It’s possibly both. Update.. After 6 wks Cytopoint shot our Yorkie mix began licking paws obsessively and then itching resumed a week later. Will be getting him another shot sooner than I had hoped. Are there any connections with a dose of CADI and a side effect of kennel cough? My pug was given a dose of CADI and less than 24 hours later he sounded like he was coughing up a lung. The first time this happened I sent my vet a video and he prescribed meds for KC. I just gave my pug a shot last evening and in the middle of the night he started hacking again. Is this related? He has not been to a kennel or near other dogs? Thanks. Absolutely not that I know of. I would worry about something like canine infectious respiratory disease (CIRD) and would talk to your vet to be safe and maybe get chest x-rays done to be safe! Cytopoint disables the il-31 molecule which is part of the immune system. Typically adult dogs get kennel cough if they have a compromised immune system. There has only been one clinical study on this drug. I have a 7 year old shelti that developed a UTI; Kennel cough; and hind quarter weakness after getting 3 cytopoint shots roughly one month apart. They really do not completely understand the IL-31 molecule and it interaction with the immune system. After seeing other people having issues with this drug, I believe that my dogs immune system was suppressed by this drug. I am not a scientist nor do I have any scientific proof, but this is what I believe. Our German Shepherd Dog has had horrible skin problems her whole life. Our previous vet (whom we loved!) felt that she has an auto immune disease and wanted to do a skin biopsy. We declined, as our dog had had too many surgeries, etc., and she is old at almost 11 years old. We previously treated her with steroids and antibiotics. We recently moved across our state to be near family and our new vet saw our dog 2 weeks ago . We explained her complicated history of skin and ear infections. The vet recommended CADI, and we agreed to try it along with wipes and shampoos. After less than a week, we thought we had a new dog. She is so much more comfortable and her skin lesions are nearly clear! I hope this continues. We have an appointment this week for followup. I am grateful to finally have something that has the potential for long-term relief. I think we pet owners need to do research on our own before allowing any medication to be give to our pet. For myself, I have been told more than once that a particular drug only had minor side effects and than found out later that wasn’t true. I would be very careful with any new medication. Forums like this one allow us to learn from others experiences. Our 1-1/2 year old pit bull/mastiff mix has been itching and scratching from seasonal allergies since we got him 6 months ago. Our vet gave him a Cytopoint injection 2 weeks ago. It helped him with the itching/scratching (didn’t stop completely) but today, 2 weeks later, he started vomiting, shaking his head, rubbing his face on the carpet and was totally lethargic. I took him to a different vet this morning and she gave him a Vetalog injection. We are now doing allergy testing. After reading all these posts, I will be calling my original vet to let them know we will not be doing the CADI anymore! Check with the veterinary dermatologist, as he can’t be on steroids (Vetalog) injection within a few days to weeks of allergy testing (skin testing). The saliva and blood tests for allergy testing are not highly recommended by most veterinary dermatologists, FYI. My dog had monthly injections for years and was fine. She developed inflammatory bowel disease and lost a lot of weight. I gave her an injection as normal and the next day she died with breathing complications. My vet told me it was not due to the injection but I suspect it was. Could this have caused her death? If your dog is truly ONE MONTH OLD, it doesn’t need CADI or a steroid shot! It’s likely a puppy disease like demodex, fleas, sarcoptic mange, etc. When in doubt, I’d check with your veterinarian about doing a skin scraping and treating based off that. Grain food doesn’t change itching b/c most dogs aren’t allergic to grain, btw. When in doubt, consider making an appointment with a veterinary dermatologist. My dog Izzy has been having CADI injections for about 6 months now, every 6 weeks. They normally work well, no problems. This time she had terrible diarrhea, vomiting and lethargy. I’m going to reconsider another injection. My 7 yr old lab mix is a 50/50 black lab and brittany spaniel. We’ve had him on prednisone for his issues for about 5 1/2 yrs and we want him off of that!! We give him benadryl occasionally if he’s having a bad day and also fish oil, and we have him down to a half a pill a day, and sometimes I can skip a day and it doesn’t bother him too much. The thing he is like a tank, about 12 to 15 lbs overweight but there’s no fat on him he’s solid as a rock and I know his hardness is from the prednisone. I don’t know now though what to do after reading these comments and replies. My vet says the prednisone will shorten his lifespan, Lord I don’t want that. Somebody tell me what to do please? I’d recommend making an appointment with a veterinary dermatologist – they can work with you on this! Unfortunately, the prednisone definitely contributes to obesity too, which itself can also shorten their lifespan. So ideally we want to get him off the prednisone with dermatology help! Does anyone have any natural/homeopathic remedies for these allergies? I can’t give my dog any more meds! Aside from fish oil, there’s none that I know of that are really effective, IMO. Anyone know if this drug might miraculously also combat respiratory issues? My dog has bad environmental allergies which cause him to be super itchy AND snotty/cough-y. Wish I could replace the prednisone with something but nothing else seems to hit the respiratory problems and he ends up vomiting bloody phlegm within a week of being off of it. He also gets to where he can’t slesp because he has to breathe out of his mouth when his nose gets so congested. Apoquel worked for the itching but not the other stuff. I hate prednisone’s side effects and am open to any suggestions. Talk to your veterinarian about referral to an internist for further workup including a bronchoalveolar lavage, bronchoscopy, etc. Also, inhalers may help! Thanks so much for this forum. My 14 year old terrier x is having lots of problems with contact dermatitis. I was on the verge of trying Apoquel but now I’m not so sure, especially given his age. Even CADI sounds iffy to me…works wonders for some but not others. Both drugs appear to cause major gut issues in susceptible dogs. What to do? I’m talking to our vet tomorrow but vety undecided. My boy is already on a NSAID for his arthritis and thyroxine so cannot take prednisolone which I don’t want to use anyway. You are definitely correct in that your dog can’t be on NSAIDs and prednisone at the same time, so definitely talk to your veterinarian about it. As your dog’s age, I’d have some concerns about it, but talk to them. YOu can also consider topical therapy too? My wonderful Boy, a six year old Samoyed was poisoned by a farmer where we live in England 3 1/2 years ago. The vet said he did permanent damage to his immune system and to his gut. His allergies increased and no meds including Apoquel helped. So last year we went to a ‘specialist’ dermatologist vet who prescribed heavy dosage of steroids. It stopped his scratching and biting but he lost fur and had major skin infections. He is also now on a series of jabs for his allergies. My regular vet also just recommended Cytopoint which has stopped his scratching and chewing and is allowing his skin and sores to heal. He is due for second jab this week. So far a few diarrheas but that is it. A bit concerned after reading all the comments. My chihuahua’s allergies are pretty well controlled with apoquel daily, however he sometimes has intense itchy flares. My vet recommended the Cadi injection. Two were given fuve weeks apart and we have just done another 3 months later. We’ve only done this during peak allergen times when his allergic responses are intense, and he has responded really well, witb an almost immediate reduction of symptoms and only slight lethargy the day of shot, then right back to normal. I feel fortunate to have a vet proactive for my little guy! Most regular vets will prescribe any drug with out knowing anything about it besides what their drug rep tells them. My dog just had this shot, and although it is working she is extremely lethargic and after reading all these bad experiences she will not be getting this shot again and I am going to detox her system. There is extremely limited research on this drug and I am kicking my self for not researching it first. Cytopoint deactivates the il-31 molecule. unfortunately they do not quite understand everything the IL-31 molecule really does for your dog. It is part of your dogs immune system. Switching this “off” may have other side effects. After two shots my normally healthy 7 year old sheltie developed weakness in her hind quarters. At first I did not associate this with Cytopoint. After the third shot she developed a UTI and then she developed Kennel cough. The latter two definitely associated with a weakened immune system. After researching Cytopoint and seeing that there was only one clinical study and other owners had problems with this drug I have decided to not have any more Cytopoint treatments. After 10 weeks of no treatments, the Weakness has started to go away and the UTI and Kennel cough are clearing up. I am not a scientist and I have no proof that this medicine caused my dogs issues, I just believe that it has. In the research, they found that the il-31 molecule causes dogs to itch and it is part of the immune system. But, they also do not know what else the il-31 molecule does in the immune system and this drug disables that molecule. There apparently was only one clinical study on beagles before releasing this medicine. Since it is a biologic medicine it does not get eliminated by the kidneys or liver, so that it does stay in the dogs system for a long time. Right now I am controlling my dogs skin allergies with Antihistamine and regular shampoos with a medicated shampoo. This has seemed to work, however with the UTI and Kennel cough she has been on antibiotics for 10 weeks. For those of you that find this drug works, I would just say be careful and watch for unusual side effects. The immune system is a complicated thing and disabling one part of it may have unknown side effects. 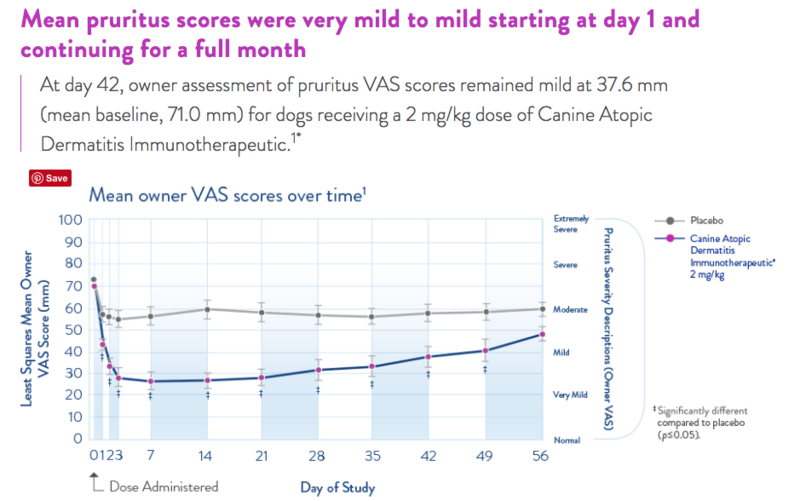 I really think that even dog medicines should require more than one study on one type of dog before the drug is released to the public. I have had my 5 year old German Shepherd Dog on Cytoppoint for about a year now and it has drastically improved her life. I tried homeopathic allergy drops, grain-free food, allergy shots, benadryl, etc. with no success. She scratched constantly and would develop terrible cases of Pyoderma 2 – 4 times a year. I did not try Apoquel due to the side effects but was willing to try the Cytopoint and saw almost immediate improvement (a few days); she is itch-free, no cases of Pyoderma and she doesn’t mind anyone petting her (touch used to set off the itching). I understand that there may be unknown side effects, but chose quality of life for her (and she loves life) and have no regrets. I dearly love my girl and want her to enjoy every day. Our boy Jax has suffered from allergies the last couple of summers. This year the ichting and licking continued into the fall and I tried really hard to manage it with antihistamines, baths, sprays, food supplements with very little success. In the fall I had him to the vet for another issue and we discussed options for his allergies. I had read about Apoquel and was reluctant to go that route so I was very interested to hear about another option – Cyotpoint. Cyotpoint is made by Zoetis, the same manufacture that makes Apoquel. It is not considered a drug – it is a biological therapy that neutralizes the protein that induces itching and seemed very safe. It is administered by injection, which lasts 4 to 8 weeks. Initially he was to have the first shot, then repeat in 4 weeks and then it would be repeated as required. On Nov. 5 Jax had the first injection and within 24 hours all licking stopped and he was happy and I was thrilled! On Dec. 5 we returned for our second shot first thing in the morning, by 3 pm Jax was vomiting, lethargic and obviously in discomfort so I rushed him back to my clinic. He had xrays, and an ultrasound and blood work. His temp was within normal range but his xrays showed fluid in the lung tissue. Jax was given an anti nausea shot, anitbiotics, and an injection of antihistamine and sent home with a case of food for gastro upset but my vet was concerned. Jax ate his dinner and spent the evening resting in front of the fireplace. In the morning I took his temp as he was not improved at all and it was now 104.9. I rushed him immediately to the referral clinic and by the time he arrived his temp was 105.3, his white cell count was very high and now his liver values were extremely high. The internist and the dermatologist felt that there was a strong likelihood that it was a reaction to the Cytopoint (in fact the internist said she had had a dog in within the last couple of months with similar symptoms). He had blood work, xrays, an ultrasound, they did a sterile urine culture and he was put of IV fluids, started on antibotics and liver meds, they sent a blood sample away for Leptospirosis (which returned negative). The good news is that he responded to treatmented well and within 24 hours I was able to bring him home and within 2 weeks his values were back to normal. He continues on a series of meds for a few more weeks and then we will recheck everything. The vets contacted Zoetis, but their response was that his reaction was atypical there was no scientific proof that Cyopoint was the cause, and the vet said really the only way to tell for sure if it was a reaction would be to give him another shot and that is never going to happen. So, please, please beware. Jax was in otherwise good health and it looks like he is going to make a full recovery and be OK.
Oh, no. I’m so sorry to hear that, Dorthy and would agree that I would NOT redose it in poor Jax. I’m so glad he is on the mend! I have a 13.5 yr old Labradoodle. He has been on Apoquel for at least 7 years. I was never told about effects of long term use and thought I had found the answer to my prayers. In August of last year he was diagnosed with liver cancer. Devestated, we had the tumor removed (surgeon had to leave “narrow margins) and he is doing much better. Again, NO ONE told me about the side effects of Apoquel. So we continued on with that drug. It has been 6 months and now he is licking his stomach area. Is there something growing in there that is causing him pain?? So, I called my surgeon and told her the entire story, she said “call your vet, being a surgeon I am not aware of the Apoquel issues. When I called my vet, she said “call your surgeon”. Dakota has a pronounced heart merm0r and therefore I am hesitant to chance an injection of Cytopoint. If there are any medical personnel out there that may be willing to give fact based opinions I would truly appreciate the help. I’m so sorry to hear that. There are rare side effects with any drug – you can always call the 800 number with Zoetis also. You can always find the Freedom of Information (FOI) information which is public access from the Food and Drug Administration. I would say in defense of your surgeon, most veterinary surgeons don’t use Apoquel so they wouldn’t be aware of the rare adverse effects. I’d talk to your vet or even make an appointment with a veterinary dermatologist to discuss this. Best thoughts and wishes to your dog.